Lindenhurst, New York, USA. Sept. 23, 2018. 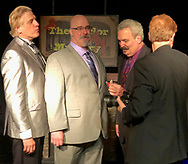 Magicians R.J. LEWIS, JOE SILKIE, BOB YORBURG & DAVID ROSENFELD perform in Comedy Magic Show presented by The Parlor of Mystery & South Shore Theatre Experience.